Haulmark Trailers is confident its new Adelaide manufacturing facility will help it better serve its southern client base as it eyes future expansions. 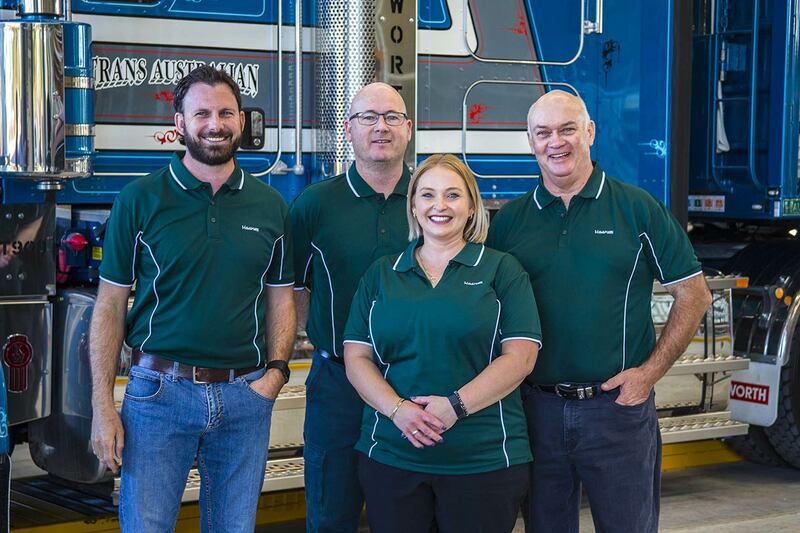 After 56 years of operating from its Brisbane base, Haulmark Trailers’ decision to open a new manufacturing facility in Adelaide comes from a desire to serve what has grown to be a substantial client base in Australia’s southern states. 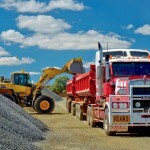 Founded in 1963 in Brisbane, the company has a strong heritage in developing multi-combination vehicles for the mining and resources and pastoral industries – which the company says has seen it enjoy a strong showing in northern Australia. Haulmark’s national sales and marketing manager Mark Johnston says the Adelaide base will help to service the Haulmark assets that have made their way to the south of the country. “They seem to get there by second or third ownership – it is not new going in there… so having the facility in Adelaide gives us a good opportunity to provide a service to our existing client base that is through that part of the world,” Johnston says. “I’m not declaring war on any competitors. We have got a well-established Haulmark client base in that location already, and this gives us a good opportunity to provide a good service for them and to grow that client base from there. 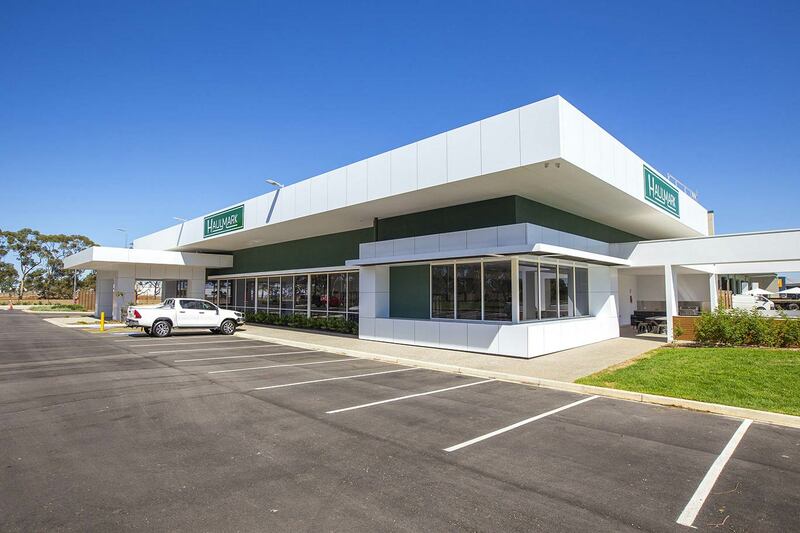 Opened last week in the Adelaide suburb of Edinburgh, the 21,000 square metre site features 3,000sqm of workshop floor space and another 1,000sqm space for a spare parts facility and showroom. Included in the new facility are two 18m Hartex integrated pits with inbuilt jacking systems, complete with oil and grease recovery systems and an air circulation system with roller shutter covers. One of those pits has a VLT shaker and brake roller tester built in, enabling Haulmark to carry out brake testing and other certification procedures on-site. 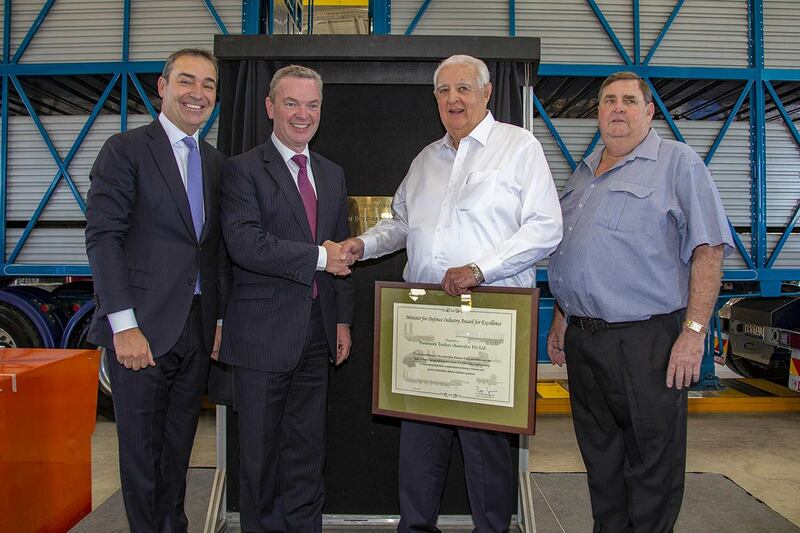 It also boasts two 20 tonne overhead cranes which Johnston says will help the company in its future manufacturing pursuits – with the company starting out by building side tippers at the Adelaide plant. “We will be doing that range of things – side tippers, skell trailers, flat tops, drop decks and then we will re-evaluate from there to make sure we are catering for the market,” he says. Johnston says the company is excited about its future, saying the transport task in the company’s focus areas continues to grow. “You don’t build a facility like that to have it half empty,” he adds. “The thing we have to be mindful of is that we can’t build everything for everybody – we have to pick the markets that are appropriate for us and what our strengths are. Words and Photos by Howard Shanks. Published in NZ Trucking July 2015. Shaving a few kilograms off equipment tare weight might increase the payload on paper, but head west of Roma, Queensland, and it’s durability that drives productivity and profit we discovered. Roma is a decent five and half hour journey west of Brisbane. 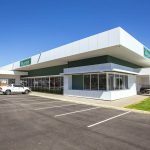 It’s a thriving town and although it is noticeably famous for its rich and distinguished history in gas and oil exploration, it is the pivotal business centre for the Western Downs. Roma is also home to Australia’s largest cattle sales, held every Tuesday and Thursday at the Roma Saleyards. The first gas field was discovered in the Roma township in the early 1900s and by 1906 the natural gas was used for lighting in the town, yet it wasn’t until the late eighties that coal seam gas production really took off in earnest. It was around that time that Charlie Burke began carting supplies and equipment for a few gas exploration and mining companies. Today Charlie along with his partner Ian Forbes operate Roma Transport a company they started when they joined their two private companies together back in 1992. At last count their fleet consisted of approximately 40 Kenworth trucks, 160 Haulmark trailers and 50 Haulmark dollys along with numerous other plant to support the gas industry. “We do a lot of work in remote areas,” Charliebegan. “A big lot of dirt work, most of it in pretty harsh conditions too. We go right into South Australia and up into the Territory where some of the more remote oil and gas locations are. Even within a 200 kilometre radius of this district we get into some pretty harsh country where they have been drilling.” “That’s why we’ve stuck with Kenworth trucks and Haulmark trailers, because they’re tough enough to endure the harsh conditions in the gas fields.” Charlie continues. “Both Haulmark and Kenworth have the support network to look after us.” “In fact we’ve currently got a rig we are servicing 200 kilometres west of Boulia, bordering on the Simpson Dessert, and it’s a trying area for any equipment, “Charlie admits. Furthermore, Charlie doesn’t scrimp when it comes to specking his trucks. 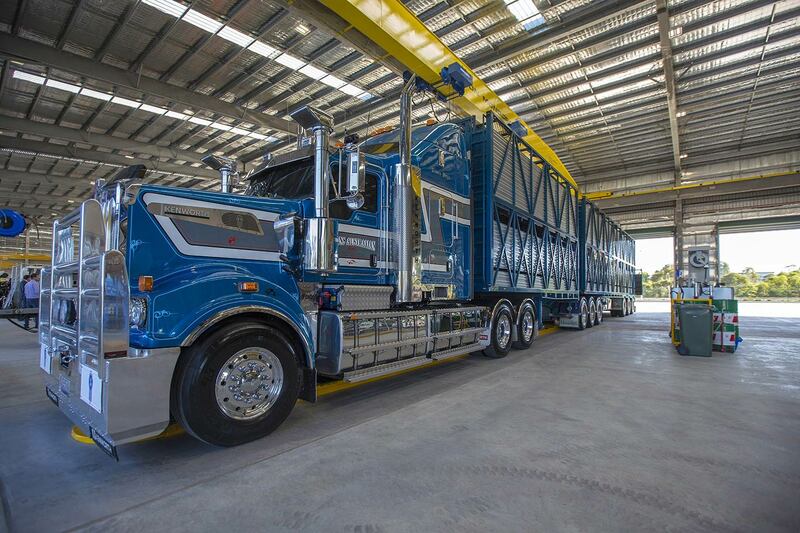 It starts with the robust double row Kenworth chassis that forms the backbone of the truck. They are no ordinary Kenworths either, they’re optioned for extreme conditions, and it’s worth spending a few moments checking out the specifications. As you’d expect power wise under the hood is a Cummins engine rated at 550 horsepower, coupled to a Fuller RTLO22918B transmission. The tailshaft is Spicer’s SPL250 that connects to Dana D52-190 axles with cross-locks in the rear, and a final drive ratio of 4.56:1 all riding on Kenworth’s KW6-60A21T steel spring suspension. Up front is a heavy duty King bullbar with robust driving lights. Meantime, ensuring his drivers are well catered for, he specs up his Kenworth trucks with TVs, Ice-Pack bunk air conditioners, fridges and water tanks. “They’ve got everything to give a bit of luxury for when the drivers are away from home,” Charlie adds. Yet despite the issues with the early EGR engine, Charlie Burke is far from being the only operator to stick with Cummins. In fact, you only have to look at Kenworth’s position in the heavy duty truck market in recent years to realize that as the only engine brand currently available at the big end of the Kenworth range, Cummins’ numbers are probably as strong as they’ve ever been. Nor can performance and an extraordinarily effective engine brake be ignored. Nevertheless, the subsequent ISXe5 is a substantially different and noticeably simpler beast to its EGR counterpart. For instance the ISXe5 uses an XPI (extreme high pressure, upwards of 30,000 psi) common rail fuel system, and a standard wastegate turbocharger along with one overhead cam instead of two like the EGR engine did. In fact the turbo used in the ISXe5 is the same as the one used on the proven Gen-2 Signature engines some years back. But most noticeable is the significant improvement in fuel economy over the EGR engine. “They’re ruggedly built, and by that I mean designed to suit our conditions,” Charlie says thoughtfully. “We get extra things like timber racks and bolsters for carting our casing and tubular loads which are removable, along with racks to put them in. Haulmark even incorporated our unique roll over ‘Road Train’ signs, which eliminates the problem of covering them up when swapping from a single or road train configuration, this way the drivers can simply flip them over. 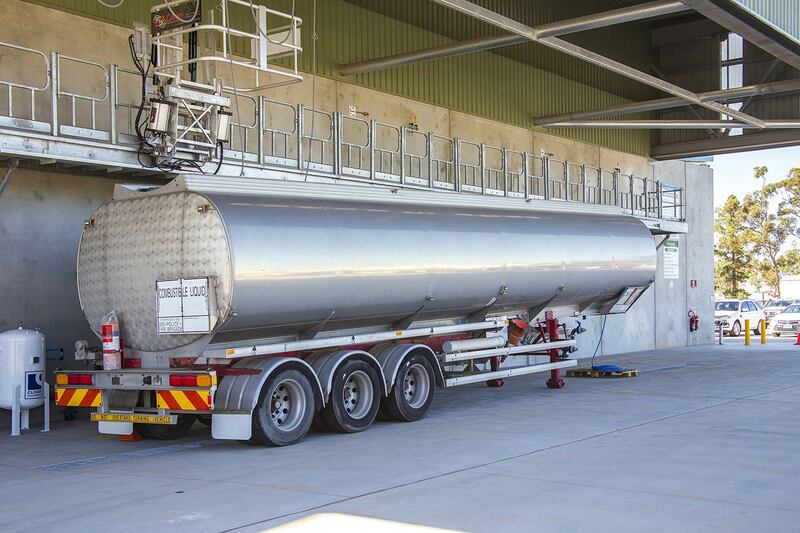 All the trailers have belly tanks that hold approximately 1500 litres of fuel. We can fuel right through from the third trailer to the prime mover. They are just things that make it easier for the men out in the field.” Charlie explains. 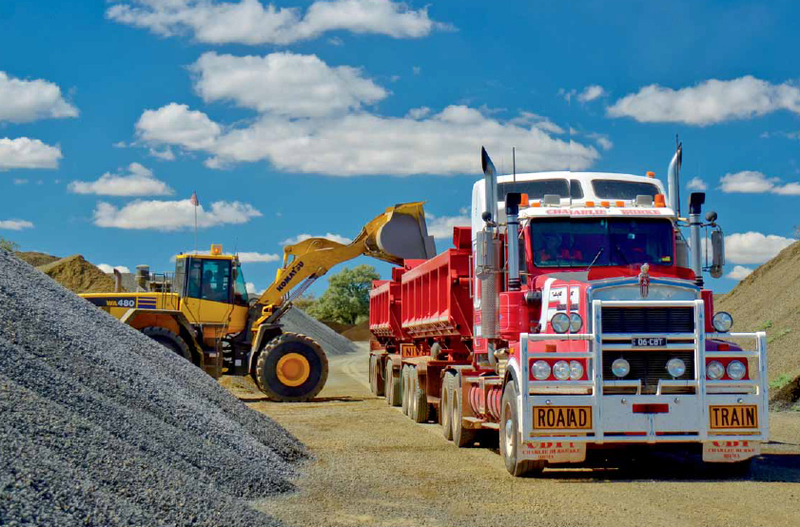 The Haulmark side tippers’ tubs are constructed in various grades of high wearing impact absorbing materials to suit the cartage of many types of materials, including road-base, screenings, rock and ore concentrates. The tub and door hinging designs have been developed to provide low maintenance and trouble free operation. The design ensures maximum tip angles to guarantee no product hang-up and a clean safe tip every time. The hydraulic systems are synchronized and the use of over-centre valves and lock valves ensure the consistent and safe tipping process is maintained through the unit’s life cycle. 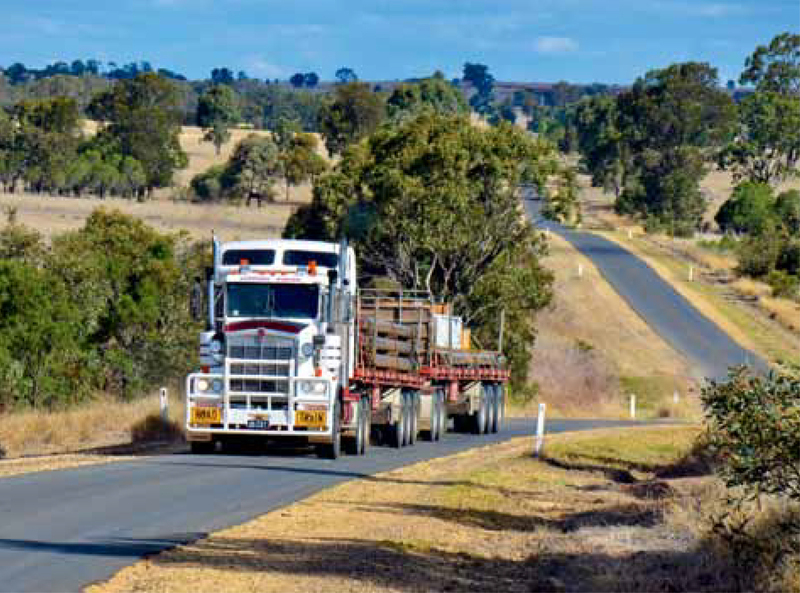 In fact a further reiteration of the respect that Haulmark Trailers have throughout the remote region of the transport industry, was being awarded an Australian Defence contract to supply them with 2500 trailers for their LAND121 Phase 5B project. 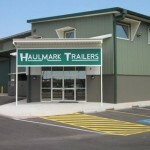 Haulmark Trailers have built a strong reputation for providing quality manufactured transport equipment. Even Haulmark’s commitment to maintenance focuses on quality, as they are capable of carrying out repairs to suit individual situations and client needs. The durability of Haulmark Trailers’ manufactured for military operations flows through to their civilian equipment as well. Their military products service anything from transportation of trucks, to fuel stores all the way to armoured fighting vehicles. Operators like Charlie Burke understand what it means when Haulmark create individual heavy transport solutions to work in the most demanding industry requirements, such as the Australian Defence tasks. For Roma Transport to deliver the company’s consistent on-time track record, all with the cargo intact, Charlie uses BPW running gear fitted to his Haulmark trailers and dollys. “Nothing compares to BPW for low cost whole of service life.” Charlie reveals. “In comparison to the other axles and suspensions I’ve used, BPW is by far, more robust and stable. He explained that a simple breakdown in remote outback Australia can cost many thousands of dollars to rectify and that’s not something he or his clients will tolerate. “Saving a few cents and kilograms on cheap equipment is just false economy out here,” Charlie adds rather fervently. 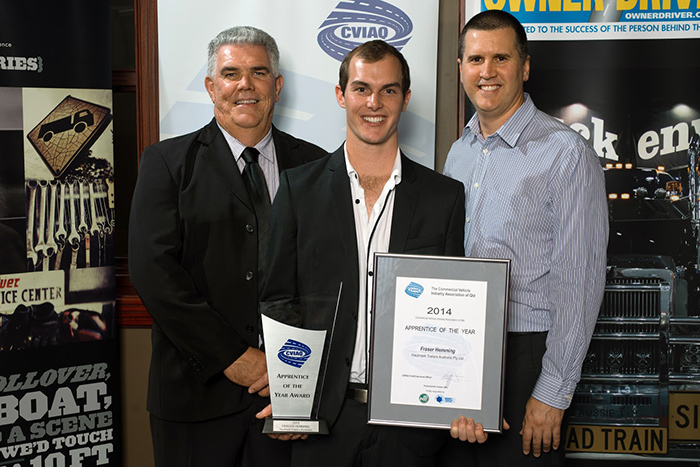 Over 170 CVIAQ members, their staff and invited guests gathered together at the Melbourne Hotel, West End on Wednesday 8th October to celebrate the achievements of some of the industry’s most talented apprentices at the 2014 CVIAQ Awards Night. The event, in its format of a stand up cocktail style function, was well supported and well received by those that attended. The less formal style has ensured that tradesmen, apprentices and management all come along to support their colleagues who have been nominated for the awards. 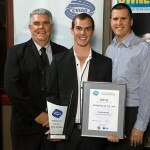 The highlight of the evening was the announcement and presentation of the CVIAQ Apprentice of the Year Award. 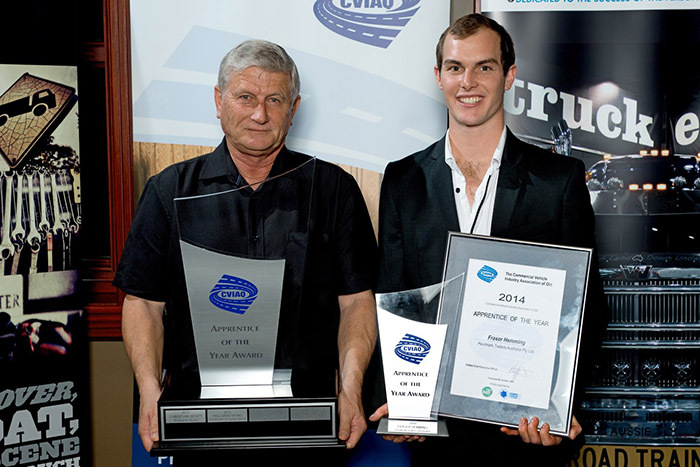 The 2014 award was won by Mr Fraser Hemming from Haulmark Trailers Australia. Sponsors of the Awards, Mr Doug Warby from Warby Tools and Mr Craig Carmody of National Transport Insurance were on stage to present the award to the winner and to say a few words in support of the competition. Fraser Hemming, who is due to be signed off for a Certificate 3 Automotive Manufacturing Technical Operations (Bus, Truck & Trailer), was presented with a trophy, a framed Award certificate, an Apple IPad and tools to the combined value of approximately $1,600.00. Mr Wayne Duncan, Workshop Manager, Haulmark Trailers Australia, gratefully accepted the CVIAQ Apprentice of the Year perpetual trophy from Mr Sam Savva, the 2013 Apprentice of the Year. The perpetual trophy was introduced in 2011 for the employer to display in their office reception or foyer for the 12 months between awards. The CVIAQ Apprentice of the Year Award is an annual award open to apprentices in the final stages of their training from the heavy vehicle repair, service and manufacturing sectors. The award, now in its thirty fourth year, is held in high regard by industry. Haulmark Trailers has now opened a repair and parts branch in Darwin.